The first way to die from radiation is to receive a high dose of radiation from a radioactive envirement. For example, Chernobyl workers who received doses of 6000 millisieverts and died within a month. Most of the 200 (not fifty!) workers a Fukushima will also die from this type of radiation exposure. There is little danger of anyone living outside of Japan dying from this type of radiation exposure. When US official tell us that there is "no risk" to anyone in the US, they are also referring MAINLY TO THIS TYPE OF RADIATION POISONING. The second way to die from radiation is to receive a low dose of radiation over a long period of time from radioactive particles which have built up within the body. For example, when radioactive Cesium-137 builds up in the bones of a child, that child will be receiving a low dose of cancer-causing radiation every day for the rest of his life. 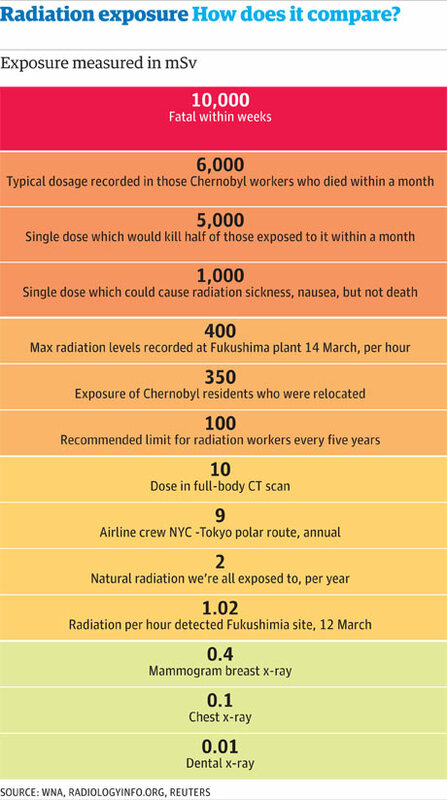 This is how the vast majority of people die from radiation poisoning. A very small amount of radioactive particles (like the radiation reaching the US) can kill if they are absorbed into the human body. The threat of meltdowns in several of Japan's nuclear power plants has raised fears about cancer — not just in Japan, but also in the USA. The organ most at risk of cancer from a nuclear accident is the thyroid gland, says James Fagin, chief of endocrinology at New York's Memorial Sloan-Kettering Cancer Center, who has studied thyroid cancer in children living near the Chernobyl nuclear reactor. The thyroid takes in iodine from the blood in order to make critical hormones that keep the body running, says Fagin, a spokesman for the American Thyroid Association. But the thyroid can't tell the difference between radioactive iodine, which can be released in a meltdown, and the normal kind. Radioactive material entering the thyroid can cause cancer. To protect children, Japan has distributed 230,000 doses of potassium iodide, a stable form. By flooding the body with stable iodine, doctors hope to crowd out the "bad" kind, so that the thyroid has little opportunity to take in radioactive iodine, Fagin says. Children and fetuses are especially vulnerable to radioactive iodine, because the cells in their growing bodies turn over much more rapidly than in adults, Fagin says. That's why exposed children and pregnant women should be the first to get potassium iodide pills. There's virtually no benefit to giving the tablets to anyone else over 20, he says. The Nuclear Regulatory Commission has said that the Japanese crisis poses no threat to the USA, but some West Coast residents, including Tom Humphreys of the San Francisco area, say they're not so sure. He's worried that U.S officials might not know the whole story. Humphreys, father of a 1-year-old and a 4-year-old, is keeping potassium tablets, used to purify water, in case it becomes clear that there is a radiation risk to the USA. After Chernobyl, radioactive material settled on the grass, where it was eaten by cows and passed into their milk, Fagin says. In both cows and humans, breast cells take in iodine when mothers are making milk, which is the main source of iodine for their children. Normally, cancer takes 10 to 20 years to develop. After Chernobyl, however, CHILDREN BEGAN DEVELOPING THYROID CANCER WITHIN FIVE YEARS OF THE MELTDOWN, Fagin says. Thyroid cancer typically occurs in middle age and is incredibly rare in children, normally affecting only 0.1 children per 100,000. Several kinds of radioactive elements released by nuclear meltdowns — including cesium-137, strontium-90 and plutonium-241 — can accumulate in the bones. That increases the risk of bone cancer or leukemia, a cancer of blood cells made in the bone marrow. Plutonium-241 also can build up in the liver, causing liver cancer, Links says. 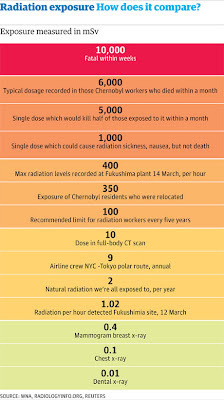 USA Today reports that radiation risk from Japan puts prevention plans to test. If there is a massive release of radiation from Fukushima, it likely will reach the USA — but it will be heavily diluted along the way, said Owen Hoffman, a radiation risk expert at the consulting firm SENES Oak Ridge Inc. in Tennessee. "We measured Chernobyl fallout in milk here in Oak Ridge," he said. "The devil is in the dose." Each ingredient in the radioactive stew emitted by nuclear reactions has a different lifespan and affects the body differently. The riskiest is radioactive iodine, scattered on the grass by rainfall, where it is ingested by cows and concentrated in their milk. Several kinds of radioactive elements that can be released by a nuclear meltdown have the potential to cause cancer. — Iodine-131: The thyroid gland takes up iodine from the blood to make critical hormones. People exposed to radioactive iodine can develop cancer if this version ends up in their thyroids. Taking a stable form of iodine, potassium iodide, helps fill up the thyroid, keeping the radioactive iodine out. Potassium iodide doesn't protect other organs. — Cesium-137: This element, which can dissolve in groundwater, goes to the bone, where it also can cause bone cancer and leukemia, which affects blood cells made in the bone marrow. — Strontium-90: This element acts like calcium, also building up in bones and teeth, also causing bone cancer and leukemia. — Plutonium-241: This element can accumulate in the bone and liver, causing cancer. The research showed that about 6,000 Chernobyl victims developed thyroid cancer, all of them younger than 18 at the time of the meltdown. Radioactive iodine doesn't appear to pose a threat to people 30 and older. Other concerns are strontium-90, which is drawn to bone, and two forms of radioactive cesium, which persists in nature for decades and can work its way into the food chain. My reaction: Just like every cigarette a person smokes increases the risks of cancer, so does every radioactive particle absorbed by the human body. Even if as the US government claims radiation coming from Japan isn't at a "dangerous level" you still don't want it in your body doing long term damage!